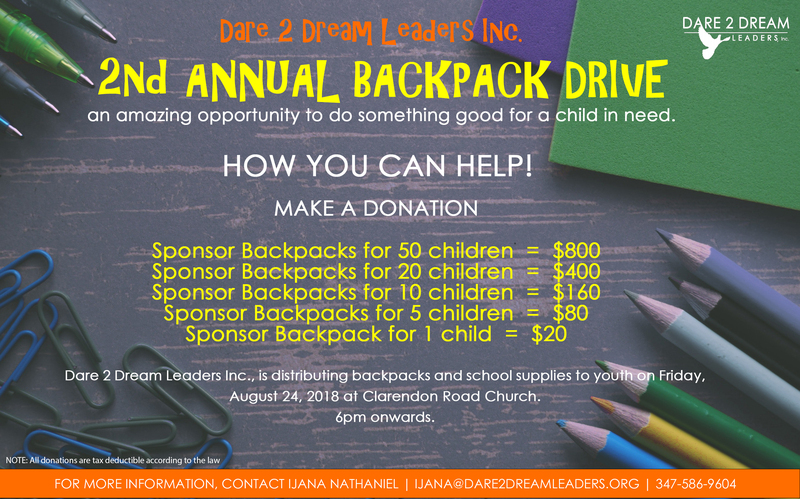 2nd Annual Backpack Drive Event - Dare 2 Dream Leaders Inc.
Dare 2 Dream Leaders Inc. organizes different events that will benefit our youth. Each event seeks to empower the youth by providing them education, resources, skills and more. And all these events would be more possible if it is supported by partners. Our humblest hearts are knocking on the hearts of other individuals to support us in realizing our mission with donations. What about the 2nd Annual Backpack Drive Event? 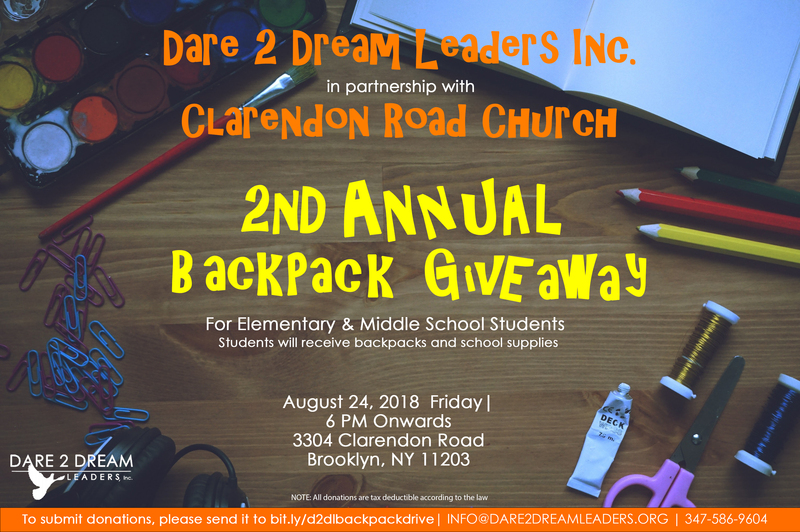 Dare 2 Dream Leaders Inc. once again partners with Clarendon Road Church for our 2nd Annual Backpack Drive on August 24, 2018, Saturday. The event will be held at 3304 Clarendon Road. During this event, we will be distributing backpacks and school supplies to youth throughout Clarendon Road from 6 pm onwards. We are seeking donations for the backpacks and supplies through August 23rd and giveaway will be on the 245th. Donations start at $20. If you are also interested in volunteering the day of the event, please contact us at the email below, you might just realize how amazing this opportunity is to do something good for a child in need.